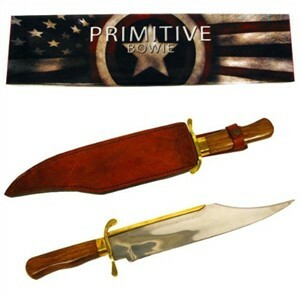 Trademark Global's Primitive Bowie clearly is too much knife for today's hunter or fisherman, but it will fit right in at frontier re-enactments. This 18-1/2-inch Bowie does closely resemble some of the fighting knives made in the days of James Black and features one classic detail missing from modern Bowie knives. What catches the eye after you get over the sudden appearance of a 13-inch high carbon stainless steel blade, finished to a mirror polish, is that unusual brass back fused to the blade's spine. There's still some argument over what exactly that brass strip was intended to do. Obviously, the brass blade guard is there to help keep the user's hand on the polished hardwood handle -- and to protect those important fingers from the enemy's cutter. The brass spine itself is a puzzle. Some think it was placed there to add strength to the blade, in days when steel was of questionable quality. Having worked with both metals, I doubt there's any reason to believe that theory. I also have more faith in James Black's ideas and don't believe he'd have worked with inferior stock. Another thought is that the brass was there to catch the edge of an attacker's blade, which seems much more likely. A heavy blade striking that strip would cut into it and lodge instead of sliding down. The Trademark Primitive Bowie includes a well-made traditional leather sheath and should be the cause of many interesting discussions at your next Frontier Rendezvous. For a beautiful, classic Bowie knife with a much more refined character, see the Zweibruder Grandpa Bowie.